“Ask and it will be given.” ~ Why the Secret and the Law of Attraction are Wrong! | Holy. Just. Love. “Ask and it will be given.” ~ Why the Secret and the Law of Attraction are Wrong! Matthew 7:7-11 “Ask, and it will be given to you; seek, and you will find; knock, and it will be opened to you. For everyone who asks receives, and the one who seeks finds, and to the one who knocks it will be opened. Or which one of you, if his son asks him for bread, will give him a stone? Or if he asks for a fish, will give him a serpent? If you then, who are evil, know how to give good gifts to your children, how much more will your Father who is in heaven give good things to those who ask him! There are so many passages in the Bible that are misinterpreted. They are interpreted based on what we want them to say rather than what they actually say. I got caught up in the “Secret” and the “Law of Attraction” several years ago. Even my Christian friends were suckered into it because it is touted as being Bible based. Nothing could be further from the truth. I think of how Satan takes truths and slightly (really slightly) modifies them to make them not true anymore but really easy to swallow as truth. You know how GMOs (Genetically Modified Organisms, aka “food that is not really food anymore”, aka “you can eat it but shouldn’t”) are just like the original only better? They grow quicker, yield more, taste richer, have less waste, etc, etc. That is what Satan hopes his “version” of the Bible does for each and every one of us. Pick and choose what we want and throw out the rest. So, back to the above verse and why our friends who teach the Law of Attraction really have missed the whole point of this passage (and other verses in the Bible that seem to say the same thing.) There are some helpful ways to interpret Scripture through the hermeneutical process. Three main areas to always consider are: Biblical Context, Historical Background, and The Bible as a Whole. Biblical context is simple. What context was the passage in question relating to? Read the verses surrounding the verse in question. Historical Background may take a bit longer to discover through commentaries and other historical reading. What did the passage mean to the people it was written to? What was going on in their time? What historical events surrounded them at the time of the writing? Why was it written, for what purpose? Who specifically was it intended for? It is important here to look up multiple translations as well as the original Greek or Hebrew words used in the passage. And lastly, understanding the Bible as a Whole can also take a while. This is often referred to as “Scripture Interprets Scripture.” You need to see where else in the Bible there is use of phrases or specific words that come up in the passage. 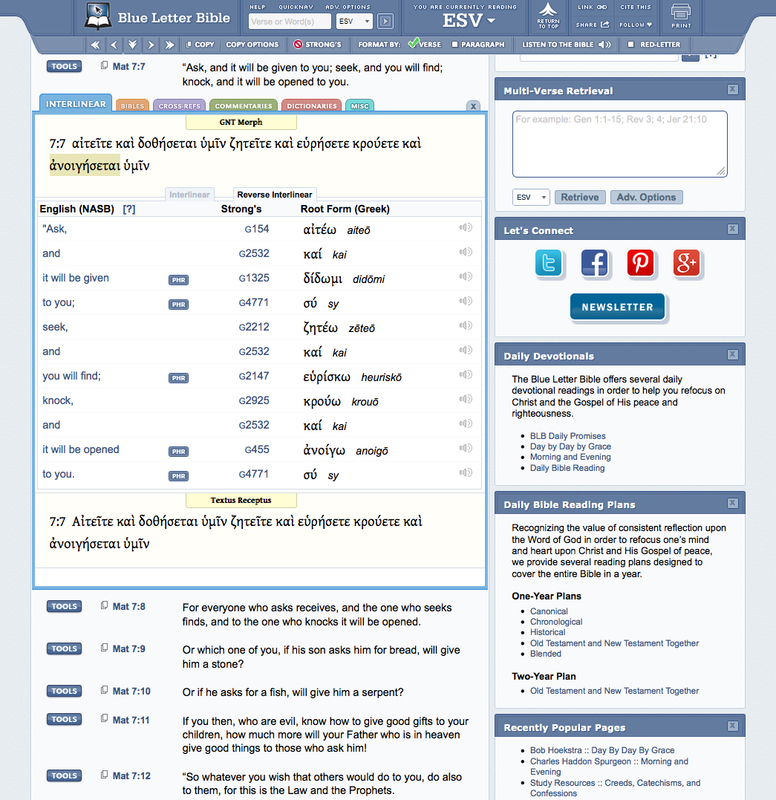 One of my favorite resources is Blue Letter Bible. See image above. It is important to research words and what they fully meant, not how one translation has decided to translate it. It is also important to find out if the specific meaning you think it means is taught anywhere else in the Bible. If it is not, then perhaps you need to rethink your understanding of the passage. So, let’s take a look at our passage in question (Matthew 7:7-11) and dissect it a bit. What is the Biblical Context? Please read all of Matthew 7 right now if you have not yet. In reading the verses before and after it seems clear they are talking about how we live our lives and how that pertains to the glory of Yahweh, our personal salvation, as well as our deserved judgement. If our relationship with Yahweh and salvation is what is in context then it would make sense that the passage is telling us to ask for salvation and the things of Yahweh. Let’s dig a bit deeper by looking at the Historical Background. What was the Historical Background? Jesus is at the end of his now famous ‘Sermon on the Mount” as read in Matthew 5-7. It is probably one of the most well know passages in all the New Testament. However, when he was giving it, and even when it was written down or passed along via pure memorization, the text in the early church was not well known like it is today. The last verse in chapter 7 states the people were amazed. What Jesus was saying was not only counter intuitive and somewhat odd at the time (in some cases very odd and downright heretical) the people were astonished. First because of what he was saying, but second because of how he was saying it. Think about it. When you hear someone speak about something they have studied, there is a sense of humility in that knowledge. It is like your pastor preaching from the Word of God. Now think about when you have heard someone talk about something they have discovered or created, like a scientist or book author. They speak with a much greater sense of authority (authorship). That is exactly how Jesus was speaking because he has authored it all! Everything. Every last word, note, hair, syllable, brick, dot, iota, cell, molecule, star, planet, you get the idea. EVERYTHING. So he has a right to speak with complete authority. People just did not talk that way back then, not even the scribes or the pharisees. There was great power behind how Jesus spoke and the people sat up to listen. Finally let’s take a look at other passages that can shed some light on this one. Below are a list of verses similar to Matthew 7:7 and are the ones most brought up in the discussion of the Law of Attraction. Before moving forward here is a simple definition of the Law of Attraction: Like attracts like. If you think it, you will be it. If you ask for it you will receive it. When we look at all these verses that seem to imply that we simply need to ask God for our desires and he will give them to us it can be very enticing to go down that rabbit hole. However, when you use the above two steps to find out what the Bible is talking about in each verse you will quickly find out that they are all talking about God’s will and not yours. It is not about your job, your bank account, the school your kids go to, your retirement plan, or even the simple day to day things that we want and desire. Yes, God wants good things for his kids but when you really study scripture as a whole, cover to cover, you will see that there really is no promise of good things on THIS earth in THIS lifetime. He is talking about your salvation and what amazingly great things (and I mean uncomprehendingly GREAT things) he will be giving you then, not now! This is quite possibly the MOST misinterpreted verses in the Bible when it comes to the Law of Attraction. People say, “Check this out, God WANTS you to have an abundant life!” I like how they take out the first part of the verse, because it is a bit confusing when it is put in the context they want it to be in. “The thief comes only to steal and kill and destroy. I came that they may have life and have it abundantly.” (John 10:10, ESV) Using hermeneutics, you will discover that Jesus is talking about salvation. You will also see that when you interpret this passage based on other scripture, the word abundant is used here to describe life upon life, or eternal life, or everlasting life, not a full and abundant life now. So, what should you do with all of this? Here are 5 Simple Steps. 1. Read the Bible fully and often. 2. Utilize your brain by looking at the complete context of a passage in question. 3. Use tools like a concordance, lexicon, and Hebrew/Greek dictionary to understand the words better. Here are a couple good ones online: Bible Study Tools or Blue Letter Bible. 4. Find a church that has great Bible based, expository preaching and teaching. Check out 9Marks to find a church in your area that professes this as one of their goals. 5. Read the Bible fully and often. P.S. ~ All of the above is one of the main reasons I am learning Hebrew and Greek. It is that important!